Over the past 18 years, I have spent more than 30,000 hours in meeting rooms working with teams from some of the top pharmaceutical, biotech and device companies as they have struggled to prepare for high profile regulatory presentations. In that amount of time I could have walked across America 6 times (that’s about 30,000,000 steps on my Fitbit). Or, I could have made 3 round trips to Mars which could have earned me almost 840,000,000 frequent flyer miles on Delta. I say the teams I have worked with have “struggled” because whenever a team needs to collaborate on a critically important presentation there will be significant challenges. 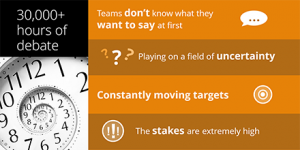 These can be lumped into the broad categories of strategic challenges (what to say and how to say it), and tactical challenges (how to manage the process in a way that lets the team effectively focus on strategy). The setting for these presentations has been FDA advisory committee meetings (AdComms). For companies developing drugs, biologics or medical devices, the stakes at AdComms couldn’t be higher. At these meetings a team of experts is convened to advise the FDA on matters related to the effectiveness and safety of the product. Our clients will typically make a 60 to 90 minute presentation, and then must be prepared to answer any question the advisory committee members might have about virtually any aspect of the product’s development. Getting ready for this meeting involves 3 to 6 months of preparation by teams of 15 or 20 in a small company, to 120 or more individuals in a large global enterprise. It means hundreds of different versions of the primary presentation will be created. 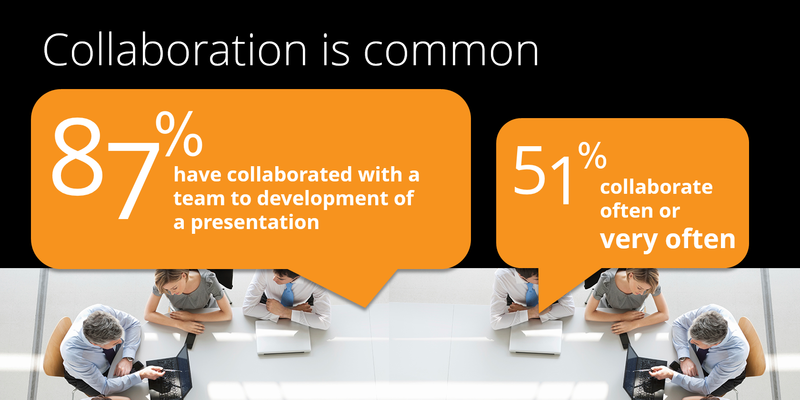 It means globally dispersed teams must collaborate to anticipate questions and prepare thousands of data slides to help answer those questions. It means tracking 1500 versions of a 120 slide presentation and developing 2000 to 5000 individual backup slides, organizing them, editing them (with version control), quality checking them and then being able to find exactly the one they need in less than 5 seconds at the meeting. It means a slide and presentation organizational nightmare. At the end of an advisory committee meeting, the committee members vote on the benefit-risk ratio of the product. A positive vote means that the benefits of the product outweigh the risks and the FDA will most likely end up approving the product for sale in the US. We have worked on many projects where a positive vote meant the launch of a multi-billion dollar per year product, or a negative vote could mean the death of a biotech startup. Very high stakes indeed. So what does any of this have to do with the launch of a brand new slide and presentation management tool called SlideSource.com? Over the years we began to develop customized tools to help ourselves and our customers collaborate and organize all of their presentation content. We started by using a process built around a product called Groove, which Microsoft eventually bought and is now part of SharePoint. After SharePoint 2007 was released, we worked with the SharePoint slide library tool that came with SharePoint. As anyone who has tried to use the SharePoint slide library knows, it was a very flawed solution from the beginning. We eventually wrote our own SharePoint workflows and event handlers to make the slide library more usable. While these improvements helped some, in order to help our customers manage their presentation challenges, we eventually re-wrote the slide library in SharePoint from the ground up and called it SlideSource SPTM. SlideSource SP is a unique and powerful slide and presentation library tool that runs on the SharePoint platform. 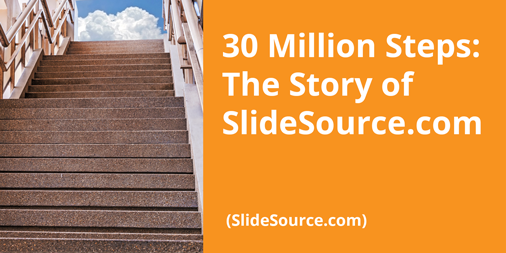 SlideSource SP was a game changer for customers using SharePoint in their organizations. Managing presentations and thousands of slides became much more manageable. It has now been used by teams from most major pharmaceutical companies in the world. Some use it in the regulatory presentation setting, while others use it in medical affairs or clinical settings. A typical SlideSource library for these customers includes almost 6,000 slides across numerous products and indications. We hadn’t… but we started to. In June we initiated the development of SlideSource.com. Although built on the same premise as the SharePoint version, our developers were no longer constrained by the limitations of the SharePoint platform. We were able to bring everything we had learned from years of managing giant, complex slide libraries to this effort. Unlike some developers, we actually use our own tools day in and day out which gave us unique insights into how an online slide library should work. Our primary goal was to maintain all the powerful slide and presentation management features of the original SharePoint tool, but to make it even more intuitive and easy to use. I think the end result is really quite exceptional. SlideSource.com has unique features designed to support any level of PowerPoint presentation management. Its simple drag and drop interface makes uploading and organizing slides and presentations a breeze. You can edit your slides in PowerPoint right from the site and version control is automatic. Because of its pedigree in helping teams manage the process of developing thousands of slides, SlideSource.com has unique collaboration features that take the nightmare out of the process, especially for teams that are globally distributed. With SlideSource.com, users can download slides or presentations, edit them, and then re-upload them to the library without breaking the version history chain. Individual slides in a presentation can be stored and edited by different team members while the presentation itself always reflects the most up-to-date version of each team member’s slides. SlideSource.com was introduced as a public beta in October 2014 at the Presentation Summit in San Diego. It will go live as a subscription service in early January 2015. You could say SlideSource.com has been in development since June of 1996 when we helped our first customer with an FDA presentation. A long road and countless steps later, we hope you will enjoy and benefit from the result of our journey.